As fires spread across the state we take notice of those who stand on the front line. Firefighters protect our personal safety and our homes. It is a dangerous job. Sadly, the men and women who choose to provide this safety and peace of mind sometimes fall. Wildland Firefighter Foundation provides support to families when a wildland firefighter death or injury occurs. 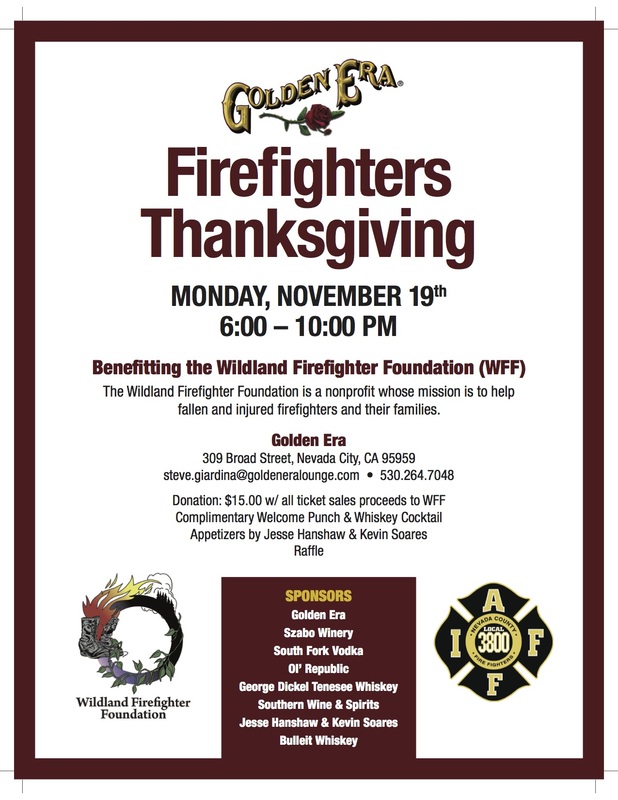 Golden Era Lounge, 309 Broad Street in downtown Nevada City, wishes to honor firefighters by hosting Firefighters Thanksgiving, a benefit for Wildland Firefighters Foundation. They invite the public to join firefighters on Monday, November 19th from 6:00pm until 10:00pm to raise funds and celebrate all fire service personnel and first responders. Complimentary Welcome Punch and a special whiskey cocktail await you. Appetizers are being provided by Jesse Hanshaw, Kevin Soares, The Ham Stand and Emily’s Catering. In addition, raffle prizes will be drawn. Tickets are $15 per adult and are available at local fire stations and at the door. Golden Era’s Eric Giardina feels it is important to provide thanks to the men and women who give so much to all of us. “When I initially proposed this event and asked a number of vendors and suppliers to join me in making it happen, I had no idea we would still be in the thick of fire smoke.” Szabo Winery, South Fork Vodka, Ol’ Republic, George Dickel Tennessee Whiskey, Southern Wine and Spirits, and Bulleit Whiskey have joined Golden Era, Jesse Hanshaw, Kevin Soares, The Ham Stand and Emily’s Catering as event sponsors.